Friday Fiddlings — Happy Holidays! Hope everyone is having a wonderful holiday season! Can you stand one more simple holiday card? It’s another resist technique. I stamped the large background image (Hero Arts Poinsettia Birds S5068) on glossy cardstock using VersaMark ink. Let it dry, then rub on Ranger Distress inks (Blue China, Mustard Seed, Lavender). Watch the magic of the white pop up! Add white knotted ribbon (anchored with a glue dot under the knot.) Stamp Hello Circles (Hero Arts CL291) on scrap paper and emboss in silver glitter. 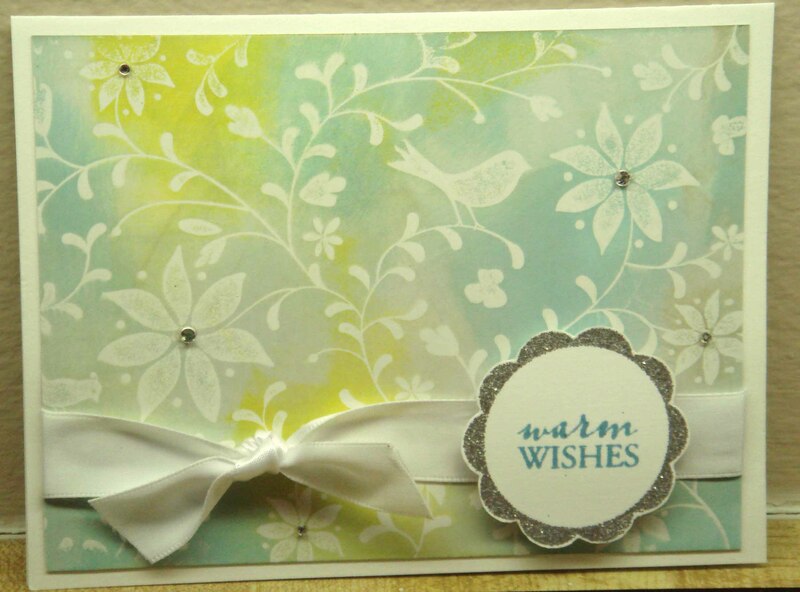 Stamp warm wishes (Hero Arts CL130) in blue. Cut out the scalloped circle and use dimensional tape (I used EK’s 3D dots) to affix it to the lower right corner. A few strategically placed gemstones finish the look. Enjoy the holiday season, no matter how you celebrate, and be safe. I’ve always loved this Dolly Mama stamp from Stamps Happen. Besides the fact that it makes me giggle, I also love it because it makes a quick card — just stamp, color and layer on background paper. The stamps are all by Judikins. Hope your holidays are getting merry! Last summer I scored these nifty cardboard boxes from a local craft store. They are made of a sturdy cardboard and have dividers. Harking back to my roots as a newspaper reporter, I covered one box with my Los Angeles Times, and added some appropriate headlines I had been clipping and saving. I spray painted the inside first, then when the paint was dry I used Mod Podge as a glue and a sealer. This one keeps my clear stamp sets accessible. Here are two others that I use to hold cards. One is covered with wrapping paper that looks like an Old World map, the other is my trusty newspaper again, with some travel cut outs. The Halloween candy is long gone (but remembered on my hips), I’ve barely digested my Thanksgiving dinner, guess that means Christmas and Hanukkah are right around the corner. I’ve been having fun playing with these new stamps from Inkadinkado (sent by my friends at EK Success). To make the snow, I ran a piece of scrap cardstock through my dotted Swiss Cuttlebug folder (using my Sizzix machine), then tore the pieces and layered them. The snow flurry was stamped in the corner using Brilliance Ice Blue ink. Glitter dots were added with Stickles. The deer (also Inkadinkado) and the sentiment (Hero Arts) were stamped in Ranger Distress Blue Weathered Wood to make them stand out a bit more. I punched out the saying using a Fiskars oval punch and added the Stickles to the edge (the edge looks so uneven, I think I will re-Stickle. And if I do another one like this, I’ll use tiny gemstones on the snow flourish). The deer and the oval are mounted on a dimensional foam.